Home > News > Kielder observatory – dark skies and stars everywhere! Tyne and Wear branch stargazing. Having anxiously watched the weather for a few days in the run up to the event in the hope of a clear crisp night, I was delighted to set off for Kielder Observatory in Northumberland around 5pm with the sky blue and a few clouds only to be seen. 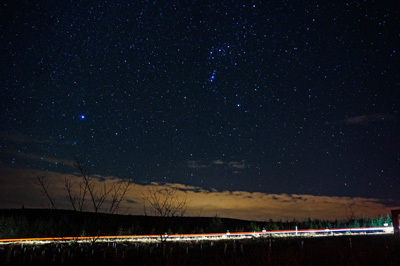 Kielder is a globally recognised Dark Sky reserve, with some of the darkest skies in Europe. Arriving at Kielder, the crescent moon was beautiful in the sky with the moon surface also being more dimly lit by the sun’s reflected light from earth (thanks Dan, our excellent Kielder astronomer and guide for the night). In total 26 of us assembled at the observatory and Dan gave us an introductory tour of the skies and what we might expect to see during the evening, although some low cloud was drifting in –fortunately that was soon to clear – at which point the star gazing began for real…. The group was split in two, to allow one group to use the large telescope in the observatory and the other group to use the telescope on the outside decking (wrap up warm!). Inside the telescope was fixed on Orion (the three stars in a line and Orion’s belt) whereas outside the telescope had a more free reign and we observed the far away Andromeda galaxy. Andromeda is an unbelievable and mind-blowing 2.5 million light years from Earth and even scarier is the nearest major galaxy to our Milky Way! By contrast, our sun is a mere 8 light minutes away. Mindful of the old adage that there are more stars in the sky than grains of sand on the earth, Andromeda contains one trillion (1012) stars. As the evening progressed so Jupiter, the largest planet in our solar system, appeared low in the clear night sky. Through both telescopes, we were all able to clearly see the gas rings and the four moons of Jupiter. Fantastic! At the end of the event, Dan gave us more fascinating insights into the sky, the planets and stars. For those interested, a star emits its own light whereas a planet is lit by the light of the sun. What an incredible event and thanks to Dan and his team, Becky and Luke, for their passion and enthusiasm towards all things astronomical. 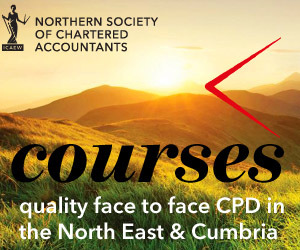 The Tyne and Wear Society of Chartered Accountants is a branch of the Northern Society of Chartered Accountants (NorSCA) which represents ICAEW members working in business and the finance profession across the North East of England, Teesside, Northern Yorkshire and Cumbria. We have been assisting businesses in the north of England and producing chartered accountants for over 130 years.